I am a mom of 2 and a yoga guide living in Minneapolis, MN. My family moved here to ‘the middle’ in 2014, after 12 years in Silicon Valley, CA, where I first discovered yoga back in 2004. I completed a 300-hr training with Jivamukti in 2011 and had wonderful support and guidance from my teacher, Giselle Mari, while I was teaching in the Bay Area. 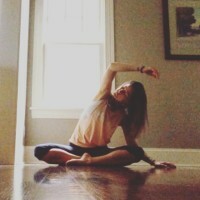 After relocating to MPLS I began to explore other styles of yoga and was lucky enough to happen upon Tara’s videos on YouTube. Practicing with her was nothing short of a revelation. I had no idea that yoga could feel so good, or that you could be ‘led’ through an experience rather than being ‘taught’ a series poses or philosophical ideas. In 2017 I completed the Chicago Intensive with Mike and Tara, and I am currently completing the 100+ hour online leadership training. My ‘teaching’ has evolved slowly but surely to ‘guiding’, and I love helping people find their own best way into feeling better and moving better. When I am not practicing Strala or guiding classes I enjoy reading, knitting, singing, walking my dog, cooking, and enjoying Minnesota’s natural beauty with my family. I am grateful to my husband and two kids, who are my biggest reasons to live with softness and ease.